Chains of paperclips, balls of rubber bands and piles of Post-it notes scattered throughout schools and workplaces everywhere silently attest that fidgety boredom, not necessity, is the mother of invention. Sometimes, though, the mother of invention is a father. Looking for a ball that his kids could more easily catch, inventor Scott Stillinger tied a few rubber bands together into a sphere of strands surrounding a soft rubber core. Little did he suspect that he had a million-dollar idea on his rubber-reeking hands. His elastic echidna, Koosh, dominated the 1988 Christmas marketplace. The multicolored dandelion went on to sell millions. 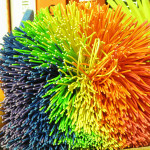 After Stillinger was bought out, the company that purchased Koosh was sold to toy giant Hasbro in 1997 for more than $100 million. Koosh remains on the market today, both in its original form and in branded crossovers.